As part of the regionalisation of Prolinnova outlined in the network’s 2016–20 strategy, the focus in 2018 is on strengthening the subregional and regional networks. On 22–23 May 2018, the five Country Platforms (CPs) involved in the Proli-FaNS project held their annual sharing-and-learning meeting in Nairobi, Kenya. The programme for these two days was drawn up by Joe Nchor, Proli-FaNS coordinator based at ACDEP in northern Ghana. A third day (24 May) was devoted to sharing about experiences with building up two subregional Prolinnova networks (in West & Central Africa and in Eastern & Southern Africa and planning how to work toward a Prolinnova–Africa network. This meeting was organised by the two subregional coordinators: Georges Djohy and Amanuel Assefa, respectively. All Prolinnova CPs in Africa were invited to Nairobi, but those not directly funded under the Proli-FaNS project needed to generate own funding for travel, lodging and food. Additional funding from Misereor allowed participation of several other African CPs. The report on the meeting can be found here. 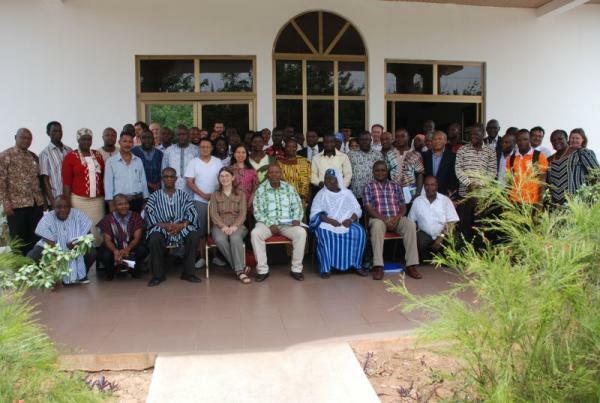 Prolinnova partners and friends from 20 countries took part in the 2017 International Partners Workshop (IPW) on 15–18 May 2017 in Tamale in northern Ghana. The meeting was hosted by ACDEP (Association of Church-based Development Projects), the NGO that coordinates the multistakeholder Prolinnova platform in Ghana as well as the Proli-FaNS (Promoting local innovation in Food and Nutrition Security) project in five African countries: Burkina Faso, Cameroon, Ethiopia, Ghana and Kenya. The network’s governance body, the Prolinnova Oversight Group (POG), met during the weekend immediately before the IPW to deliberate on fundamental strategic and operational issues central to the future of Prolinnova as an international network, including governance issues. It reviewed the status of implementation of projects and other initiatives under the Prolinnova umbrella. It also reviewed the existing Prolinnova guidelines and proposed new ones. It assessed and approved an application from Timor Leste to join the Prolinnova network as a new Country Platform (CP). During the IPW, representatives of the various CPs engaged in lively exchange and constructive discussions from early in the morning until late in the evening, showing their great commitment to the vision of Prolinnova. The marketplace and thematic sessions on local innovation for food and nutrition security, with a focus on gender issues, allowed participants to share their work and achievements and to learn from each other’s ideas and suggestions. Inputs from related work of Groundswell International in West Africa, CIKOD (Centre for Indigenous Knowledge and Organisational Development) and IIRR (International Institute of Rural Reconstruction) also provided rich food for thought. The newly appointed Prolinnova Subregional Coordinators – Amanuel Assefa for Eastern & Southern Africa and Georges Djohy for West & Central Africa – were introduced to the network. Participants from CPs in Africa and Asia had the opportunity to develop their plans for South–South mentoring, joint policy dialogue, fundraising and other regional activities. Within the few days together in Tamale, the POG and the CP partners also managed to agree on criteria for selecting the future host organisation of the Prolinnova International Secretariat; to discuss issues of governance at national, regional and global level; and to make plans for the coming year. A field visit to Yendi Municipality in the Northern Region – one of the Proli-FaNS action-learning sites in Ghana – rounded off the IPW and brought the participants in direct communication with men and women innovators in crop and livestock husbandry, food processing and soap making. The IPW report is being compiled by the International Secretariat with the help of two students from University of Virginia and their professor, David Edmunds, who has organised internships of his students with Prolinnova partners in Africa and Asia over the past three years. The Prolinnova network makes every effort to keep the costs of the IPW low so that the annual meeting can take place despite the fact that there is no core funding for it. Several participants covered costs out of their existing projects (including the Proli-FaNS project funded by Misereor/KZE) or their own pocket. The network is extremely grateful to the Swiss Agency for Development and Cooperation (SDC) for covering the travel costs of Southern participants who did not have access to any project funding. IIRR has offered to hosted IPW 2018 in the Philippines, hopefully together with a smallholder farmer innovation fair, and fundraising efforts have started already. The report on the IPW 2017 can be found here. Prolinnova-Ghana is hosting this year’s International Partners Workshop (IPW). ACDEP (Association of Church-based Development Projects), the NGO that coordinates the multistakeholder Country Platform (CP) in Ghana, is handling the overall coordination of the meeting, which will be held at the University of Development Studies Conference Centre in Tamale, northern Ghana, on 15-18 May. The participants will also be acommodated in the conference centre. The first three days will be the partners meeting, followed by an (optional) field visit on Thursday 18 May. We will also piggyback other meetings before and after the IPW, on 13-14 May and on 19 May, e.g. of the Prolinnova Oversight Group (POG) and other Prolinnova initiatives such as Proli-FaNS (Promoting local innovation in Food and Nutrition Security). The costs are borne by the participants. CP coordinators in Africa, Asia and the Andes have nominated representatives from each CP to attend the IPW 2017 and have obtained funding for their participation from project budgets (e.g. through Misereor), from the Swiss Agency for Development and Cooperation (SDC) and from other sources, including their own pockets. The programme (see below in English and French) was drawn up through a participatory process to include topics that network partners deem interesting and relevant. The opening session will be a policy-influencing event together with a marketplace of resources about experiences in the different countries. Particular attention will be given to local innovation and farmer-led participatory research for food and nutrition security, with a focus on gender issues, drawing on ongoing activities of several Prolinnova CPs. Another major topic will be how to strengthen policy dialogue to create enabling conditions for farmer-led research and development. The two new Subregional Coordinators of the Prolinnova platforms in West & Central Africa - Georges Djohy from Benin - and in Eastern & Southern Africa - Amanuel Assefa from Ethiopia - will be introduced and welcomed in their new positions, set up to support the process of regionalisation of Prolinnova activities, starting in Africa. General information for participants can be found here. The programme for the IPW in English and French can be found below. For more information about the event, please contact Michael Pervarah in ACDEP (mcpervarah@acdep.org) and Chesha Wettasinha in the Prolinnova International Secretariat (c.wettasinha@kit.nl). Asia – current situation and what is next? Latin America – current situation and what is next? How to make funding more sustainable? How to ensure that all CPs have funds to continue their work? Social evening – bring traditional clothing and music!!! Qu’est-ce qu’il est en cours de réalisation ? Comment faire le financement plus durable ? Comment assurer que tous les PPs ont assez de fonds pour continuer leur travail ? Soirée de rendez-vous – apportez les vêtements traditionnels et de la musique!!! Prolinnova/PROFEIS–Senegal coordinated by Agrecol-Afrique hosted the 2016 Prolinnova International Partners Workshop (IPW) in the week of 16–20 May 2016. Files of the presentations are inserted into the programme below. Senegal, in West Africa, is the westernmost country of the African continent on the Atlantic Ocean, at the junction of Europe, Africa and the Americas. Senegal is at a major crossroad for sea and air routes. Covering an area of ​​196,722 km2, it is bounded to the north by Mauritania, to the east by Mali, to the south by Guinea and Guinea Bissau, to the west by Gambia and the Atlantic Ocean on a 500 km front. Dakar (550 km2), the capital, is a peninsula located in the extreme west. Three rivers cross the country from east to west: the Senegal River (1700 km) in the north, the Gambia (750 km) and the Casamance (300 km) in the south. Senegal is characterised by two seasons – a dry season from November to June and a rainy season from July to October – and three types of vegetation: forest in the south, savannah in the centre and steppe in the north. Senegal has fourteen regions with an estimated population of 14 million inhabitants. Since 1 July 2013, a biometric visa is required to enter Senegal for nationals of countries that require Senegalese nationals to pay a visa fee. Nationals of other countries must present a passport, or a valid national identity card in the case of nationals of ECOWAS countries. This biometric visa is issued at the diplomatic and consular offices in thirteen countries – France, Spain, Belgium, USA, Italy, China, Cameroon, India, Germany, Mauritania, South Africa, Russia and Gambia – as well as at the Senegal border posts. Visa fees were abolished in April 2015. Please bring with you a copy of the invitation to the IPW and other related meetings as well as a travel authorisation of your own organisation. Participants from Bolivia, Kenya, Nepal, Tanzania and Uganda can also send a copy of their passports to Djibril Thiam (thiamdjibril@yahoo.fr) and assistance from Agrecol Afrique will be provided if needed to get a visa. Yellow fever and hepatitis A and B vaccinations are strongly recommended, as well as malaria prophylaxis. It is recommended to travel to Senegal with your health card/book. In May, the period of the IPW, it is warm in Thiès. The temperature varies during the day between 19°C and 32°C. This is the dry season with a dry wind. Participants have to arrange their own flights (including CLIC–SR partners, who also are responsible for booking and buying their own air tickets). Dakar is one of the largest airports in West Africa. It is served by almost all airline companies that operate in Africa. Please look for your name or “Prolinnova”on a welcoming sign inside or outside the airport terminal. A vehicle will be sent to fetch you from the airport and take you to Thiès or to a hotel in Dakar. If you cannot locate anybody to pick you up, please call DjibrilThiam: 00221771139716 or 00221766450531. Transport from Dakar to the venue in Thiès will be arranged by Agrecol Afrique and will cost 10000FCFA / € 15 per person (round trip). If your flight arrives in the evening and you need to spend the night in Dakar, please send an email to Djibril Thiam (thiamdjibril@yahoo.fr) and the Prolinnova International Secretariat (g.quiroga@kit.nl and c.wettasinha@kit.nl). A single room will be booked for you at Sargal Hotel (http://www.sargalhotel.com/index3.php). The cost of a single room is 35000FCFA / € 54, breakfast included. The currency of Senegal is CFA Francs (FCFA). 1 Euro (€) = 655.957 FCFA and 1 USD = 590 FCFA (11/03/2016). There are many domestic and foreign banks in Senegal. The city of Thiès is the city in Senegal that is second best served by banks, after Dakar the capital. Money can be exchanged through the banks or exchange booths at the airport or in Thiès. Only FCFA can be drawn from the ATMs. A welcome dinner will be held on 17 May in the evening and a farewell and cultural evening will be held on 20 May in the garden of the Centre or on the garden level of the Chamber of Commerce of Thiès (tbc). There is wireless Internet connectivity in the bedrooms as well as in the meeting rooms, the restaurant and the garden. Double room with ceiling fan only (two occupants – sharing basis) € 26 total. Double room with air conditioning (two occupants – sharing basis) € 29 total. Payments at Tostan Centre can be made only in cash on local currency (FCFA), so please plan accordingly. The IPW will also take place in the Tostan Training Centre in Thiès. There are different meeting rooms and a garden that can also be used for group discussion. The official opening will be held in the big hall. Lunches and coffee/tea will be provided during the meetings, and water will be available throughout the sessions. During lunch, water or a soft drink will be provided. Anyone wanting something different can order from the menu and pay for the extras. For self-financed participants, the tea breaks and water during the meetings will cost about € 4 per person per day, while lunch and dinner will cost about € 12 per person per day. Please let us know if you have specific dietary requirements, as this may require a prior arrangement. Dinner outside the Centre is possible but has to be arranged by participants themselves. No per diems will be paid to participants; you will have to cover any other costs yourself. Electricity supply is 220 volt AC 50 Hz. Bring an adapter for the proper plug configuration. Both round 2-pronged and rectangular 3-pronged plug sockets are in use. There are many private and government medical centres for services, if needed. At any time, the IPW organising committee or the Centre can make arrangements, including a vehicle. Simply call one of the organisers (phone numbers given above) or go to the reception of the Centre. The costs of medical help would have to be borne by the participants themselves. It would be advisable for participants to get a travel insurance for the duration of their stay in Senegal. A field visit – optional – to meet farmer innovators and an agroecological farm will be organised as part of the IPW. The costs for the visit are as follows: transport 2500FCFA/ € 4 and food 5000 FCFA / € 8, so a total of € 12 per person. The annual International Partners Workshop (IPW) was hosted on 21–25 March 2011 by the Prolinnova–Tanzania National Steering Committee and the coordinating NGO PELUM–Tanzania (www.prolinnova.net/tanzania). About 30 people from Africa, Asia, Latin America and Europe took part. It was preceded by a “writeshop” on experiences made by eight of the Prolinnova Country Platforms (CPs), including the one in Tanzania, in piloting Local Innovation Supports Funds (www.prolinnova.net/lisf). The first day of the IPW, held in Dar es Salaam, was open to other Tanzanian stakeholders in agricultural research and development. The Tanzanian Minister of Agriculture, the Honorable Professor Jumanne Maghembe gave the keynote address and formally opened the IPW. This day included an information market, presentation of the international and Tanzanian activities of Prolinnova, launching of a video on local innovation and participatory innovation development (PID), and launching of an associated project “Including Smallholders in Agricultural Research for Development” (INSARD; www.pelumrd.org/index.php/insard-argo-research). The following four days of the IPW were held in Morogoro and focused on key dimensions of Prolinnova work: mainstreaming gender in PID, strengthening multi‐stakeholder partnerships, integrating farmer organisations into Prolinnova, reviewing the network’s performance in 2010 and agreeing on future actions, including diversifying both in-country and external sources of funding. It was also an opportunity to interact with the civil-society organisations coordinating INSARD, which held its inaugural meeting at the same venue. The Prolinnova Oversight Group (POG; www.prolinnova.net/content/prolinnova-oversight-group), which had met in Dar es Salaam just before the IPW, briefed the network on its decisions. These included the welcoming of a newly formed CP in Cameroon (www.prolinnova.net/cameroon) and the go-ahead for an initiative to start a Prolinnova multi-stakeholder platform in India (contact: Ms Sonali Bisht sonalibisht@yahoo.co.in). This IPW was the first one organised without funding support from the Netherlands Directorate General for International Cooperation (DGIS). The fact that the network was able to organise the IPW using diverse sources of funding, including own funds from participants and their organisations, is an important sign of Prolinnova’s growing maturity and independence.